The War Room opens with a simple quote from the New York Times: “between 1820 and 1996, 7.1 million Germans immigrated to the United States – more than from any other nation”. Think about that figure for a moment. As anyone who has visited the US will know, the constitute parts of the great melting pot are celebrated and marked out everywhere you go, in festivities, in ethnic districts, in restaurants. Yet, if Germans make up such a huge proportion of the American population, where are they? A certain Germaness is quietly evident in America if you look for it – in the use of the word “kindergarten” for nursery, in the popularity of hot dogs (originating from the German Frankfurter), in the names of Americans from General Eisenhower to 24’s Jack Bauer, for example. But nowhere does is seem very evident; whites without an obvious origin are often generically referred to as “Anglos”, which based on the observations of this book, most certainly are not. While the British, Irish, Italian, Mexican and other groups loudly celebrate their cultural heritage, thus appearing more prominent than they actually are, America’s German immigrants seem to disappear almost entirely amid a desire to dissociate themselves from their ancestral homeland. As the book’s protagonist Sam notes, “no one wants to hear about Germans in America”. Sam Malessa starts this book as a boy growing up in small town Ohio in the seventies. A boy with a highly unusual name, and a father with an accent and a seemingly anonymous past, he dares to ask where he came from and why he doesn’t have grandparents on his paternal side of the family. He is confronted with an angry torrent of German-American history and accomplishments, but when he tries to delve deeper and learn how this applies to his father, Sam is met with violent results. He experiences alternating hostility and bitter silence as a result of his questioning, and the occasional viscous beating as his father’s attempts to open up to his son are swamped by his own traumatic childhood marked by Hitler Youth membership and the disintegration of his country after the war, of a young adulthood trying to integrate into a society that distrusts him for his origins, and a deep-seated fear of being sent away from America that compels him to carry his residency papers everywhere with him. Afraid of his father’s physical and emotional abuse, and confused about his familial heritage, Sam tries to find solace and comfort outside of his disintegrating family. He turns firstly to drugs and petty criminality, then to a rehabilitation programme, later through an infatuating love, and finally by travelling alone across the USA, finding work where he can; he works ferociously, trying to bury his fears and problems in the exhaustion and satisfaction of a hard day’s work. None of these approaches work for very long, and as his despair grows, a couple of chance encounters – with his estranged brother, a keen cyclist, and later with a retired racer who sees him ride – Sam find himself drawn unexpectedly into a world of bicycle racing. The gruelling exercise, intense competition, and a chance of success all seem to offer Sam what he has been searching for, but he knows deep inside that the only route to solace comes with the unpleasant thought of making peace with his absent father. The novel is structured into several smaller books, each dealing with a distinct phase in Sam’s life and he grows up and moves around the country. Despite that we are only with Sam until his mid-twenties, there are an awful lot of phases and changes; in many ways the first half of the book felt more like a series of mini-stories to me than one continuous narrative. The early sections change location, focus and characters in rapid succession, and once Sam has moved on, he rarely makes reference to or contact with any part of his past. In a way this felt a bit like Forrest Gump; while I liked that one life could have so many stories in it, at the same time I felt frustrated, and found it hard to believe that so much could happen so often to one person. It was also quite hard to get to like Sam, when he happily took assistance and kindness from others, then left without warning or future contact. He is quite an unpleasant character at first, and it took a lot to start to root for him and his desire for a better future free of his father’s inherited guilt. It was only in the second half of the book, as things began to tie together more clearly as a continuous story that the novel really began to absorb me and compel me to read on as quickly as I could until the end. The War Room is the author’s second book. Malessa’s previous novel, The Flight, was one of the first in English to cover the little discussed issue of post-war German expulsions in Europe, so the topic of Germaness in America as a background theme to Sam’s odyssey is not surprising. That Sam shares a hometown, a surname and an interest in this theme with the author implies the text is semi-autobiographical; it did make me wonder if the author had also been a bicycle racer in his youth as well, and the detailed descriptions of the psychology, tactics, training and methodology used by riders all struck me as sounding like they came from personal experience. If not, then he has certainly done a huge amount of research to be able to describe the sport in such a fluid and compelling fashion, and I found his description of Sam’s racing career to be the highlight of the book for me, despite that it was not intended as its main theme or focus. The book was well-written, although perhaps a little too long for the story it tells. I did enjoy it, though – perhaps all the more for having read it during a trip to Berlin, where so many elements of the subject matter were more tangible than normal for me. Whatever the faults of The War Room, it is a story of identity, of losing it and finding it, and coming of age – and that is always a story worth reading. 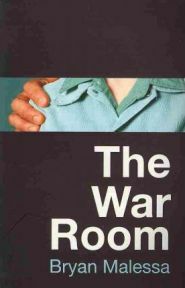 With thanks to the publishers for providing me with a review copy of The War Room. No Comments on "The War Room"